Founded in 2006, Donald and Donna Smith opened Gold Star Transport, Inc. in an effort to fill a void for Salem and surrounding hospitals with a reliable 24 hour non emergency medical transport service provider. It was their ultimate goal to ensure patients leaving the hospitals had safe, compassionate transportation home. 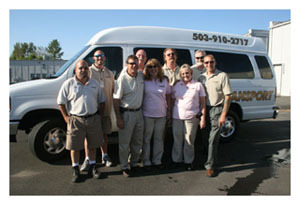 In four years, this simple plan has turned Gold Star Transport, Inc. into the number one choice for non emergency transportation in the Willamette Valley. We proudly service several major hospice and palliative care companies in Marion, Polk, Yamhill, Linn, and Benton counties and we hold two state contracts with OHP/Medicaid brokerages. When we first opened our doors in May of '06 we were a small family owned and operated company running four vehicles 24 hours a day, 7 days a week. Our hard work has paid off and we are now operating a fleet of nine vehicles and have nearly tripled our staff. We still run the same hours and maintain a reliable reputation amongst our business affiliates. Our company became incorporated in 2008 but is still managed by family. And, although we are a larger company now, we still operate with a local focus. We take pride in knowing we've earned the trust of our community in providing them with our Gold Star service.